Notebook for students. The ThinkPad Edge E145 delivers long battery runtimes and excellent input devices. This makes it ideal for those users who have to do desk work outside of offices and homes. We will scrutinize the computer in our review. The ThinkPad Edge E145 is familiar to us, since this design has already been in use for several years. The look remained unchanged; changes took place inside. The Edge E1XX series consists of Intel and AMD models. We reviewed a model with an A4-5000 APU (Kabini) from AMD. A few months ago, we reviewed a sister model with an E1-2500 APU (Kabini), which managed third place in our Subnotebook Top 10. Our review will reveal whether the new model can keep up with it. Because of its display size, the ThinkPad Edge not only competes with other subnotebooks and netbooks but also with tablets and convertibles. Therefore, we compare it to the following competitors: Asus Transformer Book T100TA-C1-GR (Atom Z3740, HD Graphics (Bay Trail)) and HP Pavilion TouchSmart 11-e000sb (AMD A4-1250, Radeon HD 8210). Since we have already reviewed another model of the ThinkPad Edge E145, we will not cover case, connectivity, input devices, and speakers here. Detailed information about these aspects is available in our review of the technically identical predecessor. Lenovo uses a matte 11.6-inch display with a native resolution of 1366x768 pixels in the ThinkPad Edge. Unfortunately, it is dark with a below-average brightness of 185.9 cd/m². Contrast (441:1) and black value (0.46 cd/m²) are alright but not great. The average DeltaE 2000 deviation is 10.9 in factory state. Most displays come up with similar values. None of the colors can reach the target range (DeltaE smaller than 3). The display is bluish. The Lenovo ThinkPad Edge outdoors. Thanks to its matte surface, the display can be used outdoors. However, too bright environments should be avoided because of the low display brightness. Lenovo used a conventional TN panel. As a result, the viewing angles are narrow. 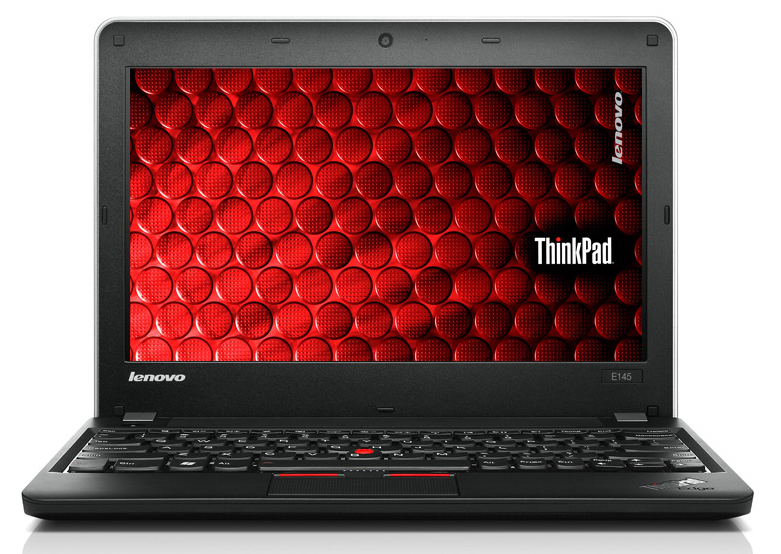 The ThinkPad Edge E145 series includes mobile and very enduring 11.6-inch notebooks. The devices are suitable for typing and occasional surfing. The computers can also play videos. Our test device costs about 480 Euros (~$660). Those who are satisfied with an E1-2500 APU and do not need a Windows OS, can get the notebook from 320 Euros (~$440). The ThinkPad Edge is powered by an AMD A4-5000 APU from the Kabini generation. 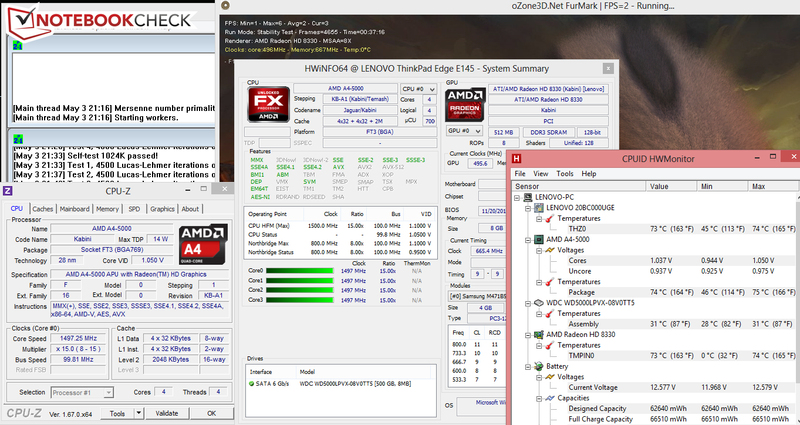 The four CPU cores of the APU clock in at 1.5 GHz. A Turbo is not available. AMD specifies a TDP of 15 Watt for the APU. The processor always runs at full speed during the CPU tests of the Cinebench benchmarks. Overall, the ThinkPad Edge performs better in these tests than its two competitors since it features the fastest CPU. The Transformer Book can keep up with the ThinkPad Edge in multi-thread applications and even performs slightly better in several tests. 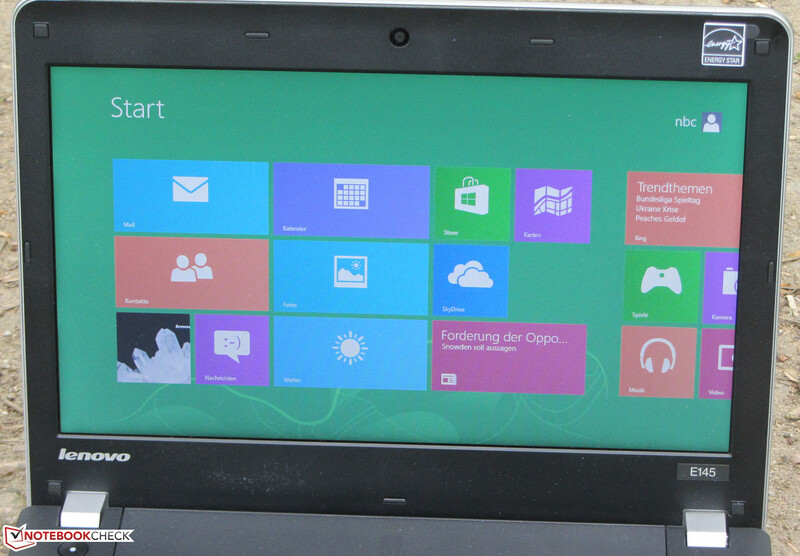 However, we could not run 64-bit tests, since Asus only installed a 32-bit version of Windows 8. The system runs smoothly in most scenarios. As long as the processor is not overloaded, there are no delays. The PCMark 7 results are on the level we are used to from computers with AMD APUs. Despite a weaker processor, the Transformer Book achieved a better result thanks to its SSD. Although it is not a particularly fast model, it is still faster than conventional hard drives. Lenovo equipped the ThinkPad Edge with a hard drive from Western Digital's Scorpio Blue series with a capacity of 500 GB and a revolution speed of 5400 rpm. The measured values are normal for a 5400 rpm hard drive. A Radeon HD 8330 GPU is responsible for graphics output. The GPU supports DirectX 11.1 and clocks in at 500 MHz. A Turbo is not available. Since the ThinkPad Edge features the fastest graphics core, it achieves better results in the 3DMark tests than the two competitors. The small ThinkPad Edge was not designed for computer games. Nevertheless, several games can be played with low resolution and low quality settings. Games with modest demands on hardware - for example, games of the FIFA series - also allow higher settings. While idle, the fan runs quietly, yet audibly. Under load, it gets louder, but the noise remains within limits. The TouchSmart 11 is similar while the Transformer Book is silent since the convertible does not have a fan. The ThinkPad Edge during the stress test. The ThinkPad Edge never gets particularly hot. The temperatures are in the green in all measurement segments. The same is true for the TouchSmart. But, the Transformer Book gets warmer during the stress test than its competitors since it lacks a fan. The CPU clocks at 1.5 GHz in mains operation and on battery during the stress test (Prime95 and Furmark run for at least one hour). The graphics core clocks at 500 MHz in mains operation and at 400 MHz on battery during the stress test. The CPU temperatures hover at around 74 °C during the stress test (mains operation). (-) The average temperature of the palmrest area of similar devices was 28.6 °C / 83.5 F (-3 °C / -5.4 F). The ThinkPad Edge does not need a lot of energy. The power consumption is as expected. The TouchSmart and the Transformer Book need significantly less energy since they use weaker CPUs. The E145 sister model with E1-2500 APU also requires less energy. This is not surprising since it only features a dual-core CPU. The first Edge E145 model with E1-2500 APU reviewed by us shone with excellent battery life. It is clear a priori that the model with an A4-5000 APU cannot keep up with it since it comes with a quad-core CPU. Nevertheless, the small ThinkPad Edge does not need to hide. In our realistic WLAN test the ThinkPad Edge achieved a battery life of 7:44 h and is not too far behind its sister model (8:19 h). The Transformer Book's (10:47 h) is even longer, but the TouchSmart (4:23 h) shuts down significantly earlier. During our WLAN test, websites are automatically loaded in 40-second intervals. The energy-saving profile is active and the display brightness is set to about 150 cd/m². 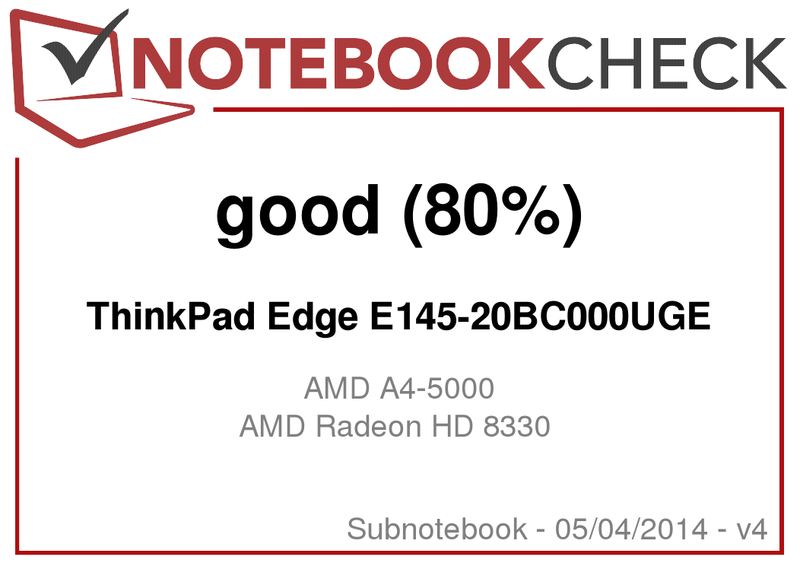 The Lenovo ThinkPad Edge E145-20BC000UGE is the slightly more powerful relative of the model already reviewed by us with an E1-2500 APU. The performance is absolutely sufficient for simple tasks. The computer only needs little energy, works quietly in most scenarios and it hardly gets warmer. In addition, it has excellent input devices and is easy to maintain. Furthermore, the battery life is excellent. The display is a point of critique: It is rather dark, low-contrast, and bluish. A warranty of only 12 months is no longer appropriate, either. If you do not need more processing performance, you can safely buy the model with an E1-2500 APU. It is already available for 320 Euros (~$440, without Windows OS). The advantages of the Asus Transformer Book T100TA-C1-GR are its longer battery life and that it can also be used as tablet. The HP Pavilion TouchSmart 11-e000sb is not a real alternative. It performs worse than the ThinkPad Edge in all aspects. Long battery life, excellent input devices and low power consumption. With its weight and battery life, the ThinkPad Edge is ideal for mobile use. The dark, low-contrast display is not suitable for this, since it makes it nearly impossible to use the device outside of buildings. Asus Transformer Book T100TA-C1-GR, HP Pavilion TouchSmart 11-e000sb, Acer Aspire V5-131, Lenovo IdeaPad S215, Toshiba Satellite NB10t-A-101, Lenovo ThinkPad Edge E135, Lenovo ThinkPad Edge E130.